Today could be a nice day for the left coast. I took a look at some races, and found some runners that need a look by you before going to the windows. Be sure to run them against the tier levels, and take it all into consideration. Martin Garcia in the irons for Baffert, and gets blinkers on today. Add in three solid works, and you may have an answer to put to work. A $450,000 sales purchase at Keeneland, and goes from 5 1/2 to a mile. Six wide last out, and if there is any better trip this time, I think we will see a good payoff. Corey Nakatani up for Eoin Harty. Faced better maidens last out, and this son of Fu Peg can get it done. Last race was a five wide effort, and if he cleans up the trip, I would not be surprised to see him get his picture taken. David Flores in the irons for James Cassidy (22%). 2/2 ITM at Del Mar, and comes off a three off the shelf action. I like the rail draw, and if you look at his last race, he faced the likes of Sidney’s Candy in the La Jolla. 1 1/16 to a 1 1/8 can help, and a runner finds the wire. Mike Smith in the saddle for Bill Spawr. He is fresh off a claim, and that gets the barn a 20% win clip. 3/4 at the distance, and the new surroundings may help the cause. Smith should get his best, and may score at a price. How’d your Del Mar Pick 6 ticket do on Saturday? We went a lousy 2 for 6! It was pretty disappointing after the huge Churchill Downs carryover after the Derby and the large Saratoga carryover a few weeks ago. 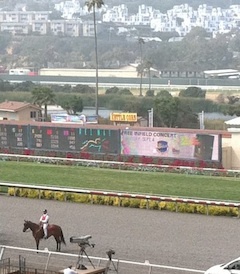 We were really hoping to hit that $5m Del Mar carryover!!! Oh well, there will always be a next time! Thanks for sharing your experience over the weekend! Personally, I rushed together a $108 ticket and had 4 winners and 2 seconds. I actually trimmed one horse in the last race (from $144) and that was the winner. Otherwise I would have seen a profit with 5 of 6 for $243. The one race that was particularly difficult was the Darley. If I was going to put together a legit investment, I would have went deep in that race and then the Pick 6 was definitely hittable. If you are curious, from the straight picks on our site, the winners were 3rd pick, 2nd pick, 1st pick, 5th pick (Darley), 2nd pick, 3rd pick.